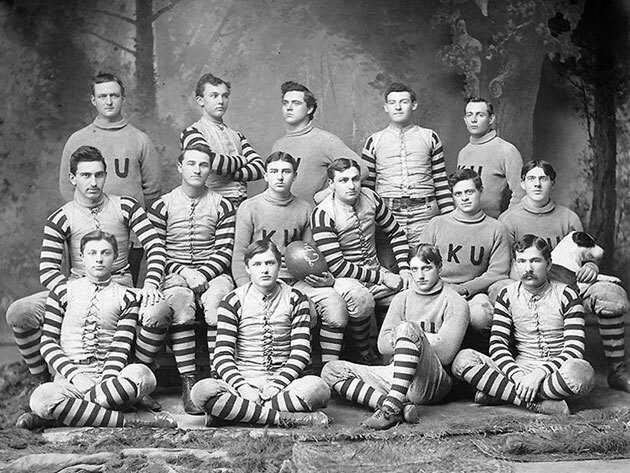 Kentucky University Football Team. 1892. Photographic Archives. Transylvania University. According to John D. Wright, Jr., the first intercollegiate football game in the south was played in Lexington in April of 1880. (The first recorded game, in any event.) Kentucky University beat Centre College 13 3/4 to 0. Football’s arrival heralded big changes, on and off the campus. This was the era of “muscular Christianity,” the era of the bicycle craze, the era that would turn the strenuous outdoor life into a badge of health. And as the character of games and pastimes was shifting, ideals of manhood, womanhood, and youth were shifting right along with them. Add the sharp increase in college enrollment which came after World War I, and it was easy enough to appreciate, if only in retrospect, why undergraduate life would never be the same again. On Kentucky University, the transitional institution between antebellum Transylvania and the schools we know today as Transylvania and the University of Kentucky, see Wright’s Transylvania: Tutor to West (University Press of Kentuckky, 1975). For a general account of the shifting centers of gravity which defined undergraduate life, see Helen Horowitz, Campus Life: Undergraduate Cultures from the End of the Eighteenth Century to the Present (University of Chicago Press, 1987). On sport, see John Thelin, Games Colleges Play: Scandal and Reform in Inter-Collegiate Athletics (Johns Hopkins University Press, 1994). On gender politics, see Kim Townsend, Manhood at Harvard: William James and Others (W. W. Norton & Company, 1996).